Did you know that through the first two weeks, the Bengals equipment managers probably didn’t have to bother washing Andy Dalton’s uniform? He’s only faced pressure in the pocket from opposing defenses (Raiders and Chargers) 11 times total, and has yet to be sacked. The only other QB yet to hit the turf through two weeks is Carson Palmer. The closest Dalton came was Sunday where a would-be sack was ruled an incomplete pass upon further review. Dalton is way too comfortable for my liking back there. I would really like to see the Ravens dial up more blitz pressure in their upcoming matchup. A lot on the line for the Ravens. A win in the division is always important, would keep Baltimore from starting 0-3 for the first time in franchise history, and would keep them from a three game hole in the division race, as the Bengals would improve to 3-0 with a win. Must win? Close to it. Getting back to Dalton, pressure is the key. It’s a small sample size given only the 11 pressures he’s faced. But in those 11 instances he’s only completed five balls (45.5%). Without pressure, he completes 73.5% of his passes. If he is able to complete 70+% of his passes this Sunday in the Ravens home opener, the Bengals will be well on their way to a fourth straight win against Baltimore. It will be tough to generate pressure on Dalton without Terrell Suggs. We now know this after the pass rush was non-existent in Oakland. But the Ravens need to find another way. Sending an extra man maybe. Power in numbers. Dalton also gets the ball out quicker than almost everyone in football. His average time from snap to attempt is 2.19 seconds. The only guys faster are Phillip Rivers (2.09 seconds), and Tom Brady (1.97 seconds). Another guy who gets the ball out this quick is Derek Carr (2.25 seconds). The Ravens defense struggled against Dalton, Rivers and Brady in recent years, and Carr just last Sunday. Whatever theory Ravens Defensive Coordinator, Dean Pees, has used in these games, clearly isn’t working. Tom Brady completed 66% of his passes in the playoff game a year ago. Phillip Rivers posted a 75.6% completion rate in their 2014 matchup. Over two games last year, Dalton went for 69.7%. Carr went for 65.2% last week, but it felt closer to 90%. Still too high for a QB of his caliber against the collective talent the Ravens defense has. So it’s not just good quarterbacks that pick this scheme apart. Every single one of these games have one thing in common. The Ravens defense plays “bend but don’t break”. That means, allow short plays, but don’t get beat with the big play, the deep ball. Tighten it up on your side of the field, hold them to field goals and keep them out of the end zone. It’s not my favorite, and it isn’t working despite trying to keep things short, the deep ball still beats them. AJ Green in the opener last year caught one to essentially win it. On a trick play, a deep ball from Julian Edelman was a key score in the playoff game with the Pats. Last week, Lardarius Webb got caught expecting safety help that wasn’t there for a deep ball. 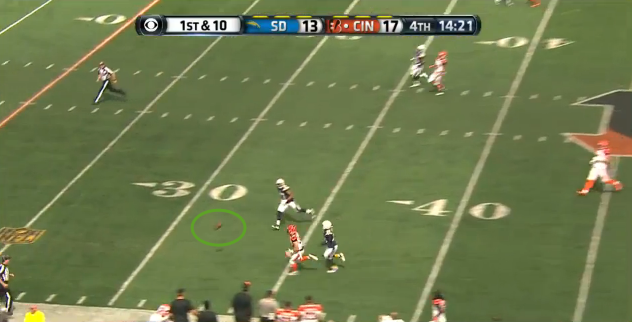 A ball that Michael Crabtree had to come back to, or else was a TD in stride. Or so badly underthrown that if Webb kept up, he makes an easy INT, maybe swings the shootout type scoring in the Ravens favor. Let’s not forget, the Raiders game aside, Terrell Suggs was on the field for the others. If the Ravens generate a pass rush, it doesn’t allow the deep ball plays to develop. It throws off the timing of short and intermediate routes. It makes Dalton uncomfortable, which no one has done yet, and he’s had his way by posting a 120.3 QB rating through two games. It goes further than the pass rush. “Bend but don’t break” also suggests that the cornerbacks play off the line. Keep the plays in front of them so they don’t get beat off the line in a foot race for a deep ball. Again, nice, but It’s no good when a team is facing 3rd and 5, and the corners are lined up eight yards off the ball. This strategy that allows 10-15 plays for 70-80+ yards, rather than three-six plays, low percentage plays at that, also wears a defense out, and they are gassed by the fourth quarter. Time of possession is huge in controlling a game, and is a major factor in winning games. They were too gassed to get a stop in Denver, allowing Manning to engineer the longest drive of his career. They were too gassed in Oakland to stop Derek Carr in a two minute drill. “Bend but don’t break” works only when a team doesn’t take what you are willing to give them. It’s in large part why from 1999 to 2011, the Ravens pass defense ranked in the top ten, ten times in 13 seasons. Since Dean Pees has taken over as coordinator, that unit ranked 17th in 2012, 12th in 2013, and 23rd a year ago. It doesn’t work. Be. Aggressive. B-E-Aggressive. The scheme needs to change. Make Andy Dalton beat you deep. Dalton is 2 of 7 on balls traveling over 20 yards this year. Oddly enough, both completions went for touchdowns last week against San Diego. He was 16 of 54 in that department in 2014 (33.3%). Those are low percentage throws. The two TDs aside, these passes will not be completed more often than not. The short passes off three step drops, high percentage passes, are his bread and butter. Don’t let him have those, like they let him have those in the past. Be aggressive. Man up on the receivers at the line. Jam them, be physical with them and disrupt their rhythm because they are clicking right now. More often than not, the result will be this…. Man coverage, with a press at the bottom, about everyone is within ten yards of the line of scrimmage. 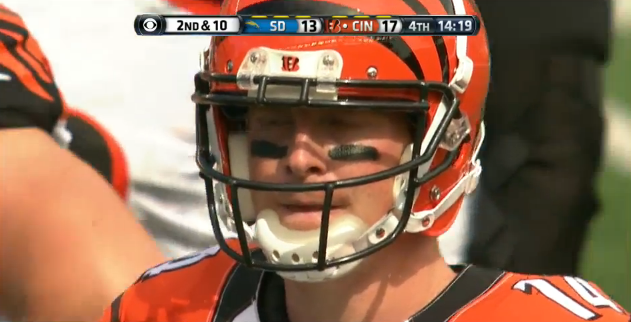 Dalton thinks he’s got a deep shot with the safeties playing up. 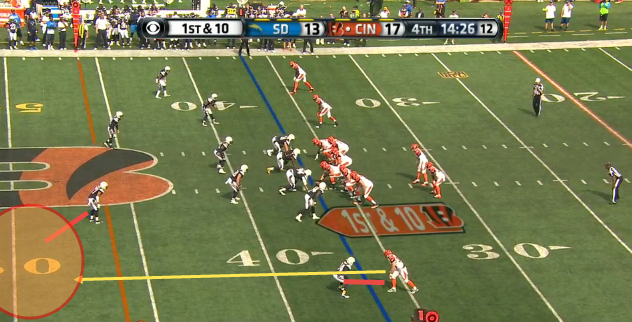 Dalton goes deep, but the safety retreats and takes a great angle. 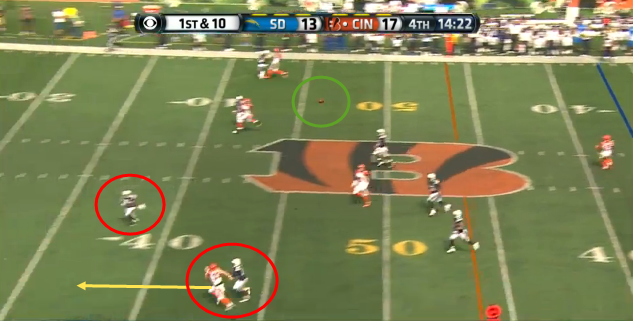 Dalton’s receiver is in great position though, beating the CB. Dalton just made a poor throw. That’s why they are called “low percentage passes”. Even with the catch, the safety still likely knock him out of bounds there.